4 Bedroom Semi Detached House For Sale in Liverpool for Offers Over £330,000. 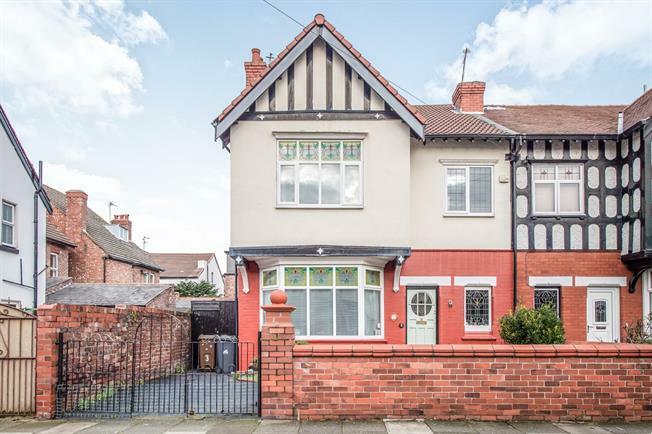 Situated in an ideal Crosby location, Entwistle Green are presenting to the market this immaculate "front doors together" style property, boasting a host of original character features. This exceptionally spacious family home comprises; porch, reception hall, dining room, lounge, spacious kitchen/diner, first floor landing with four double bedrooms and a family bathroom and wc. The property also benefits from a driveway and garden to front and enclosed rear garden. Early viewings of this impressive home are strongly recommended. Grand entrance hallway with feature stained glass and leaded light window to front. Wood effect flooring. Radiator. Spacious under stair storage. Original panelled door with stained glass and leaded light panel. Living flame gas fire with surround. Double glazed uPVC windows with stained glass and leaded light. Radiator. Impressive rear lounge with character arch over rear bay window. Real "open" fire. Wood effect flooring. Radiator. Fitted wall and base units with complementary work surfaces and breakfast bar. Housing for fridge, washing machine and dishwasher. Wood effect flooring. Dining area. Radiator. Windows to side and rear. External door. Feature cast iron fireplace with tiling. Double glazed uPVC window to stained glass and leaded light. Radiator. Cast iron fireplace. Wood effect flooring. Double glazed uPVC window to rear. Radiator. Cast iron fireplace. Wood effect flooring. Double glazed uPVC window. Radiator. Thermostatic shower over panelled bath. Wash basin. Double glazed uPVC window to side. Radiator. Low level wc. Double glazed uPVC window to side. To front driveway, rockery and laid lawn via entrance gate. To rear enclosed garden with raised patio seating area and timber pergola with roof, laid lawn with mature shrubs and borders.